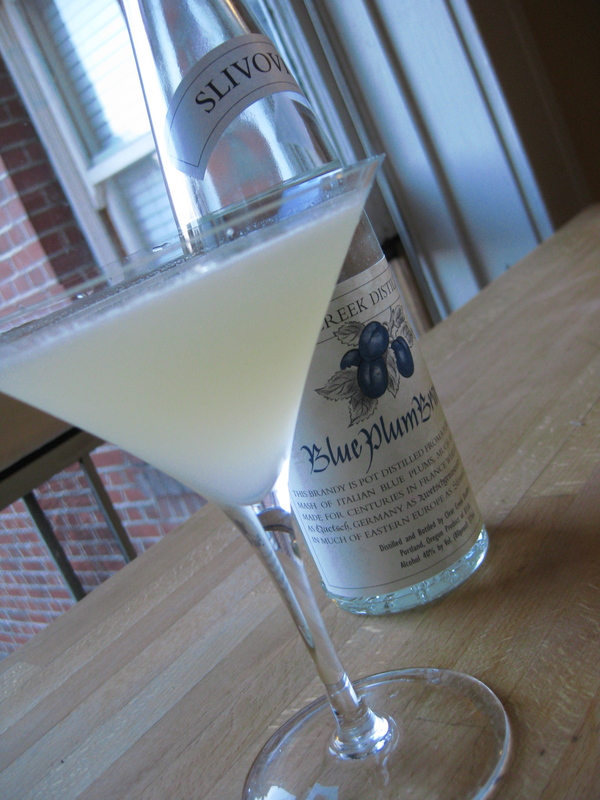 If you were going to pick a random spirit to build a cocktail around, I’ll bet “slivovitz” isn’t the first thing to spring to mind. Me neither – but here it works to fantastic results. Slivovitz is a fruit brandy or eau-de-vie made from the fruit and pits of Damson plums, which have a fairly acidic skin and thus are most commonly used in making jams. It’s often referred to as “plum brandy” or rakia in the Balkans. Most slivovitz comes from the Slavic areas of Central and Eastern Europe – Serbia, Czech Republic, Slovakia, Poland, Hungary and Bulgaria. The majority of which is also consumed in those countries, or abroad by Eastern European emigrant communities. Also known as: “my peeps”. For some, it is the taste of an ancestral home, where boiled vegetables are considered a delicacy and vowels are an endangered species. For others, it is the taste of diesel fuel infused with old wool socks aged in a damp basement. In either case, it is not for the faint of heart. Traditionally, it’s consumed in small shots while toasting, similar to Russians and their vodka, where the burn is likely part of the testosterone experience. However, I have come across some craft distilleries putting out a domestic artisanal product. The bottle I have from Clear Creek uses Pacific Northwest Italian blue plums and hews closer to the cleaner profile of the rest of their eau-de-vie lineup – with the exception of their Douglas fir experiment which has a taste only one of Santa’s elves could love. Here, the often unruly slivovitz provides the backbone while its subtle plum and almond kernel features are brought forward. It calls for an 8-year aged plum brandy by Navip fromSerbia. I haven’t had the 8-year brandy before, but I assume the aging in wood mellows out the eau-de-vie and sweetens it. Not wanting to invest in a second bottle of slivovitz, I used the Clear Creek I already had. The result was so surprising that I think I’ll pick up a bottle of the cheaper-by-the-ounce Navip before I wind up draining the Clear Creek. Brian MacGregor of Jardiniere who came up with the “tipple” says he could drink one of these every day – and I really can’t argue with him on that.